The Lair of Filth: Filthy Music Review and Track Stream - Possession - Exorkizein. 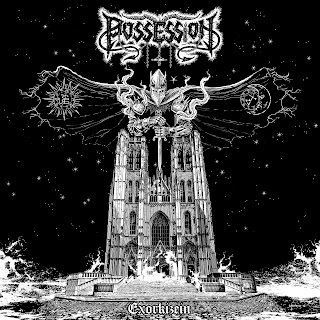 Belgium’s Possession have been forging a name for themselves from formation in 2012 with the result being the band is now one of the black/death undergrounds hottest and most promising entities. 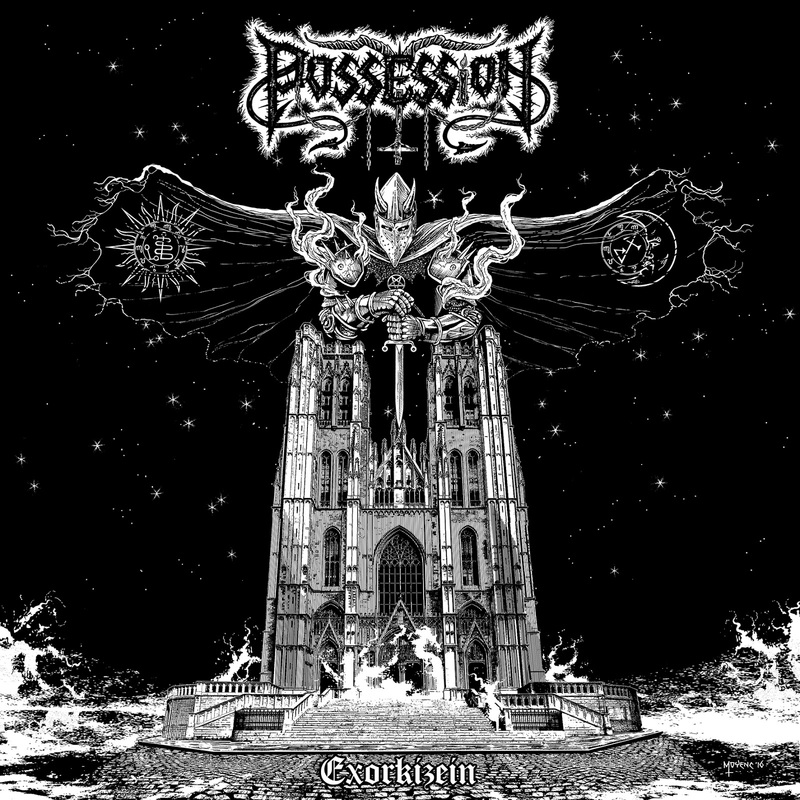 In April Possession’s evolution will take a further step forward as they are set to release their debut album, Exorkizein, which is easily one of the year’s most anticipated albums. 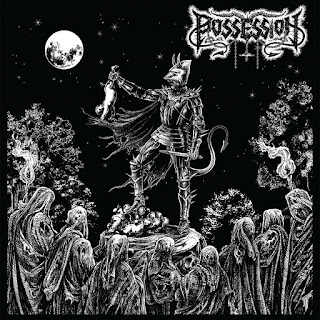 Possession’s first release came in the form of the “His Best Deceit” demo which was released jointly in November 2013 by Invictus Productions (CD) and Iron Bonehead Productions who released it on cassette. The demo immediately generated the band a lot of praise and won over many fans, exploding in a blaze of “incendiary charisma” with some exceptional music. The band has always had quite an individual and attention grabbing sound, a heady cocktail of up-tempo black/death metal with a vicious and primitive edge, combined with the band’s highly addictive song writing and more compulsive riffs than you could ever hope for. The stunning Anneliese 7” EP followed a mere six months later, also co-released by Invictus Productions and Iron Bonehead Productions, it features two lethal tracks that illustrated further haunting depths to the bands ability and style than previously shown. 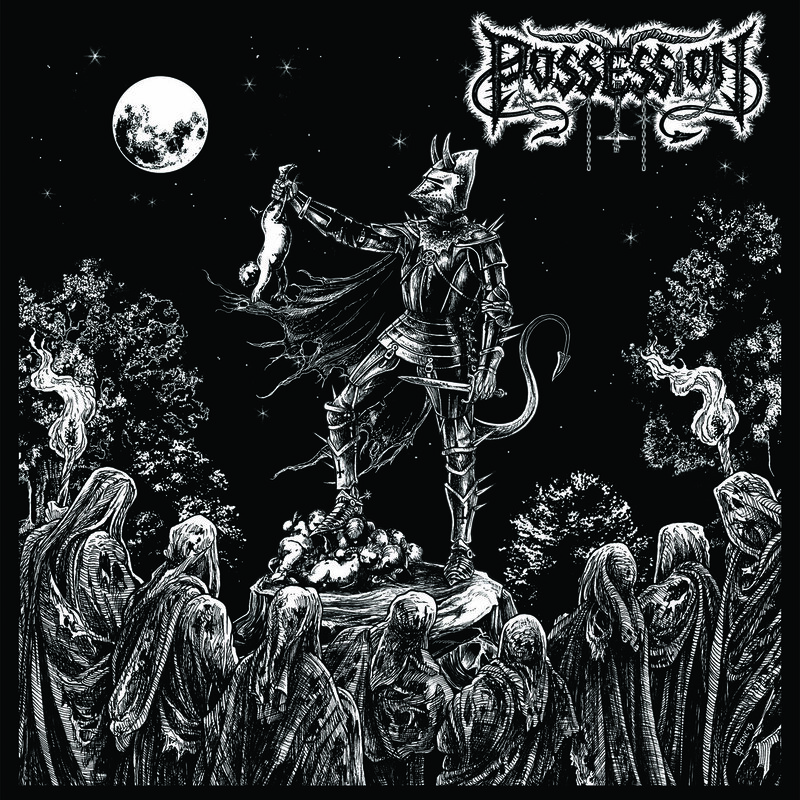 Both releases and a string of live dates put Possession’s name into the minds of legions of underground fans worldwide, no mean feat when you consider until that point they had only released six tracks. The band returned in June 2015 with their mini album entitled ‘1585-1646,’ again co-released by Invictus Productions and Iron Bonehead Productions. Clocking in at twenty five minutes this was easily their longest release to date, and also their most ambitious in terms of song writing and lyrical themes as it saw the band using the four tracks featured to document the story of a medieval witch living in France between 1585 and 1646. The mini-album further cemented their reputation while at the same time showing their ever growing fan base hints of the greatness yet to come. Thankfully we are set to witness more from Possession in the form of Exorkizein which the band somehow managed to write in a year during gaps between several live appearances. The album features seven tracks across thirty seven minutes and was recorded at Blackout multimedia with Phorgath (Enthroned, Emptiness) and the artwork once again is the creation of the legendary Chris Moyen. Again the band and labels have shown their uncompromising loyalty to each other as this will also be a co-release between Invictus Productions who will release the CD and Iron Bonehead Productions who will release the LP. Exorkizein also sees a change in Possession’s line-up, vocalist Mestema is no longer a member of the band and S. Iblis has joined the band as bassist with the previous bassist, V. Viriakh now performing vocals. Possession plays with commitment and aggression like no other band, with an energy, passion and charisma that, when combined with their musicianship and song writing ability, makes for one of the most explosive and distinctive sounds you’re likely to hear. Pure power and energy come from every note and one of the band’s many positives is the fact they are even better live, witnessing them in the live environment is not to be missed – nor is this album. 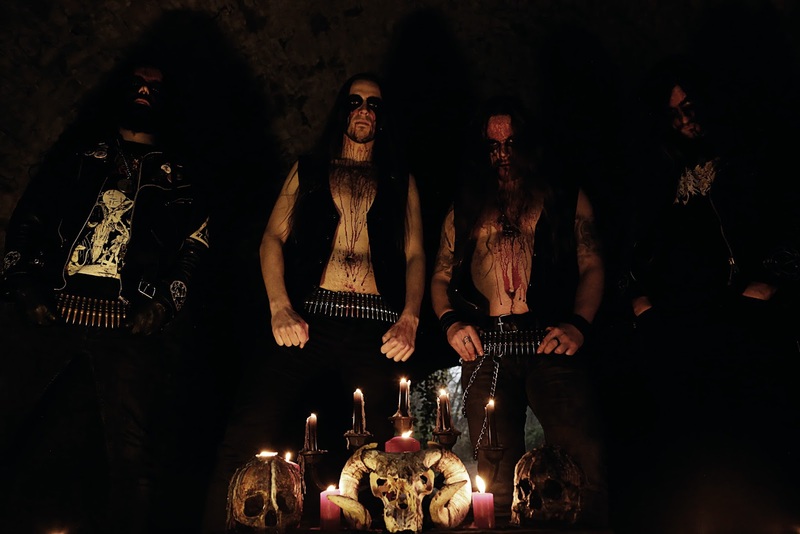 ‘Infestation - Manifestation – Possession is available to stream below and fully shows us just how potent Possession’s music has become. In a similar fashion to their previous two releases Exorkizein explores lyrical concepts, telling the story of the life, work and death of Gabriele Amorth who was the Vatican’s last known chief exorcist who died on the 16th of September 2016, with the band stating “We started writing about him before his death, but it seems that Evil was once again on our side, as the exorcist died while we were still writing lyrics. We changed the lyrics in regards of that event." Sacerdotium - This song is about the young priest Amorth swearing the oath of the Exorcist. “His heart filled with faith, a young & devoted priest is about to accept the exorcist sacerdotium..."
Infestation - Manifestation – Possession - Explains the three steps of the demoniac possession. “As written in the holy book of exorcism, demoniac possession comes by progressive steps ...when the last one is complete; it is already too late..."
Beast of Prey - The demon speaks through the voice of the possessed one. “Hear the words of the Evil invading your soul, feel his fire burning inside you, let him speak through your throat and tongue..."
In Vain - The exorcist performs the ritual on the possessed one, but preaches are sung in vain as the demon is the strongest. “Hard is the work to fulfil the exorcism ritual, only a few can achieve it, many are done in vain..."
Take the Oath - The now-old priest Amorth indoctrinates young priests to force them to take the exorcist oath. “Used as living weapons, exorcist priests must kneel before the altar and swear an oath for lifetime..."
Preacher’s Death - On his deathbed, the priest wishing to return to his creator is now tormented by demons telling him that Evil can't be defeated. “At the twilight of his life, devoured by sickness, the priest is waiting to join his creator, but demons are tormenting him as they wait for his soul to ascend..."
Across all their releases to date there’s not a single dodgy track, and Possession has pushed their skills even further with what they have achieved here – I’ve no doubt the band will continue to improve but, to be honest, if they continue to release music to a standard as high as this they’ll easily become modern day legends. Hardworking and dedicated to their art there’s no band that deserves an album as good as this more than Possession, they’ve worked their asses off to reach this moment and deserve nothing less than total support. Easily be one of the year’s best releases and an easy 10/10. Possession's Exorkizein will be available from Invictus Productions and Iron Bonehead Productions from the 7th of April - other releases and merchandise are currently available from both labels.